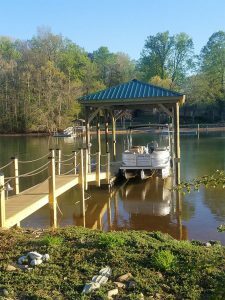 We can revamp, construct or repair your boat docks in the Lake Hickory area of NC, so you are 100% satisfied. If your boat dock is in disrepair or just doesn’t suit your needs, the answer is giving us a call at Renegar Construction. With our 15+ years of experience, quality materials and state-of-the-art equipment, we can revamp, construct or repair your boat docks, so you are 100% satisfied. On top of all those qualifications, we are familiar with many of the lakes in North Carolina and South Carolina, including Lake Norman, Lake Hickory, Lake James, High Rock Lake, Lake Wylie and Mountain Island Lake. This puts us in the unique position of knowing what types of boat docks are best for various situations, even if that means a floating dock is the best option. We build boat docks that are high-quality and built to last. We can also revamp existing boat docks to lengthen their life and make them safer for you and your family. Our owner, Gene, goes on every project to make sure all goes perfectly. In addition to repairing, revamping and building boat docks, we also do the other tasks that might be needed to prepare your property, including dredging and seawalls. We can also add features, such as a boat house. Although we can tackle the large jobs, no job is too small, either! If you just need some minor repairs to your boat dock, retaining walls or shoreline, give us a call, and we’ll be glad to provide a comprehensive estimate for the project. From design to completion, our boat docks will exceed your expectations.